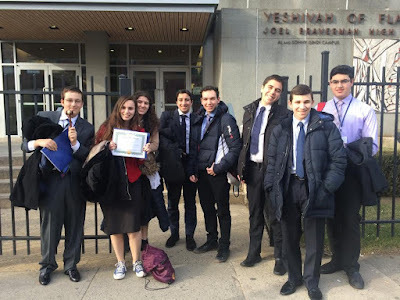 Congratulations to the YOFHS Model Congress team on their performance at HAFTR's "Yeshiva League Model Congress" competition that took place on Thursday March 3 / 23 Adar I. Freshman Robert Adler was awarded a gavel as "Best Delegate" in the "Armed Services" committee and Kimberly Alweiss was recognized with an "Honorable Mention" award in "Environment and Public Works." YLMC 2016 consisted of over 200 student “delegates” from various yeshivah high schools, who participated by presenting original bills, debating, amending and voting on other bill proposals and learning firsthand how the legislative process works. Gabe Vizgan, Ben Wade, Shlomo Husni, Florence Deutsch, Moses Bakst and Netanel Benshabat all participated at a very high level, as well. The event was an educational and enjoyable experience for all concerned. We look forward to future success in this program!